For the anaesthetist performing an ultrasound guided regional anaesthetic (USGRA) procedure, the issue of where to place the local anaesthetic (LA) should now be crystal clear. After all, the gross anatomy of peripheral nerves has been thoroughly documented, and we have the knowledge obtained by over a decade of ultrasound imaging to add to our understanding of the appearance of nerves and their surrounding soft tissues. However, it turns out that this issue is muddied by some confusing terminology and uncertainty about the safety of injecting LA very close to nerves. This review aims to clarify a confusing area of clinical practice. 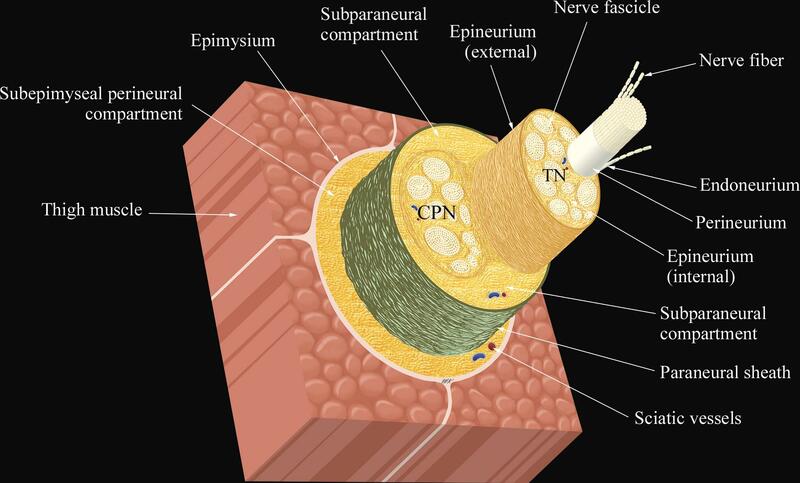 The basic structure of a peripheral nerve starts with the individual nerve fibre, which is surrounded by an inner fascial layer called the endoneurium. Groups of nerve fibres are collected into bundles called fascicles which are surrounded by a tough fibrous sheath called the perineurium. Fascicles are then clustered together by the external covering of the nerve; the epineurium. 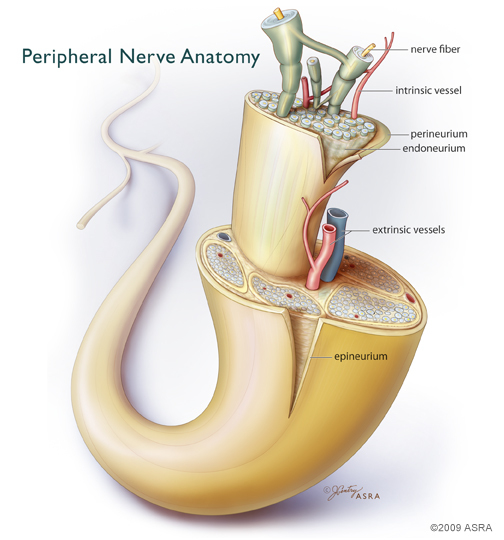 All peripheral nerves have an epineurium whether they are an individual nerve or part of a plexus. Peripheral nerves begin as spinal nerves, and here their external layer starts as a continuation of the dural nerve sleeve and subsequently blends into the epineurium. (1) In addition to these connective tissues within the nerve, it is clear there are also extraneural connective tissue layers which provide mobility and protection to the nerve, and will be discussed further below. Several recent studies of the brachial plexus have used a different approach to the above terminology. Bigeleisen et al (2) examined the anatomy of nerves of the brachial plexus aiming to measure their neural content as the nerves moved from proximal to distal. However the terminology used in this study is at odds with the description of nerve anatomy above as the term epineurium is used to describe the external connective tissue layer of the entire brachial plexus, implying that LA placed inside this layer results in an intraneural injection. A second study by the same group (3) describes the nerve stimulation thresholds for intraneural and extraneural supraclavicular blocks. Again the term epineurium was used to describe the compartment containing all the nerves of the brachial plexus. Not surprisingly they demonstrated a lower current was required for a motor response for an “intraneural’ needle position compared to an “extraneural” one. The nerve anatomy diagram above (figure 1.) suggests that the epineurium is the external layer of an individual nerve rather than the covering layer of the entire plexus. An alternate interpretation of the anatomy is provided by Franco et al (4) in his study of the brachial plexus sheath in human cadavers. In all specimens, he was able to identify “a macroscopic envelope of fibrous tissue” surrounding the brachial plexus. It is several millimetres thick, contains nerves and vessels, and runs from the neck to the upper arm where it blends with the deep fascia of the arm. This suggests that the outer layer referred to by Bigeleisen et al above, can be more simply viewed as an extraneural connective tissue layer or sheath of the brachial plexus. All the nerves within have their own epineurial covering. Injections within this space are intra-sheath (or intra-plexus) but remain extra-neural. Franco added to his earlier descriptions of the brachial plexus fascia in a recent editorial on the subject. (1) Here he clarifies that the epineurium is the external layer of the nerve regardless of whether the nerve is a root, trunk, division, cord or branch. He also defines an intraneural injection as being one in which the epineurium is breached. There is a similar level of confusion in the lower limb when considering the sciatic nerve (SN). When performing a popliteal sciatic nerve block, if the LA is injected close to, and between the tibial nerve (TN) and common peroneal nerve (CPN), both nerves appear to be surrounded by outer fascial layer. This layer has been referred to as a sub-epineural sheath (5), a complex fascial layer (6) and common paraneural sheath. (7) The study by Tran in particular suggests that injection beneath this layer should be considered an intraneural injection. Several recent papers have clarified the terminology. Referring again to Franco’s editorial (1), we can see that the CP and PT nerves are separate nerves as they do not mix their fibres and each have their own investing epineurium. Just as in the brachial plexus, there is an additional extraneural investing layer of fascia containing both nerves that runs from the origin of the SN and down into the popliteal fossa. This is now referred to as the paraneural sheath. Finally, just when it was all becoming clear, there is in fact one further fascial plane to be described! In a recent study using high definition ultrasound in patients undergoing foot surgery, Karmakar et al (8) were able to identify another layer of fascia outside the paraneurium. This is called the epimysium. compartments that surround the sciatic nerve, before its bifurcation at the popliteal fossa. This epimyseal layer is a well-defined intermuscular space filled with adipose tissue and vessels. Injections of LA beneath this layer are into the subepimyseal perineural compartment. Local anaesthetic injected here or beneath the paraneural sheath are both considered extraneural. Where to inject the LA? Having now sorted out the terminology, it should be reasonably straight forward to decide where to put the LA. However, perhaps not surprisingly, the best place for the LA is still a topic of some debate. There are three possible techniques; intraneural injection, sub-paraneural injection, or perivascular (peri-plexus) injection. Deliberate intraneural injection has been described and advocated by Bigeleisen and his group. Their technique is to inject LA directly into the nerve by breaching the epineurium whilst still remaining outside of the fascicles containing the nerve bundles (an intraneural extrafascicular injection). (9) They argue that intraneural injections have been performed accidently for years using nerve stimulation techniques, usually without complications. Details of the technique include avoiding very proximal nerves (e.g. interscalene brachial plexus) which have very little non-nerve tissue, using a blunt short bevel needle and injecting very small volumes of LA. It is fair to say that deliberate intraneural injection is not widely accepted and most authorities believe it should be avoided. Sub-paraneural LA placement now seems to be the preferred technique for popliteal sciatic nerve blocks. (5-8,10) The evidence suggests sub-paraneural injections result in improved block quality for all block parameters. Interestingly, in a recent editorial Abdallah and Chan (11) offered a more conservative interpretation of the literature and advised caution with paraneural injections arguing that current US technology still limits our ability to discriminate between the different layers of connective tissue. In the brachial plexus, intra-plexus injections can be either perineural (PN), where LA surrounds each nerve, or perivascular (PV) where LA is placed within the sheath deep to the artery without targeting individual nerves. Bernucci compared PV to PN techniques in the axillary brachial plexus. (12) Somewhat surprisingly, the different techniques produced similar clinical outcomes with comparable success rates and procedure times. A similar study of infraclavicular blocks compared LA injected beneath the axillary artery with PN injection of the 3 cords. (13) Again, outcome was equivalent. Finally the peri-plexus technique involves placing LA close to but largely outside the plexus or investing fascia. For an interscalene block this means between the scalene muscles, without breaching the sheath. When compared with an intra-plexus technique, Spence et al found the peri-plexus technique produced comparable results. (14) Overall there still seems to be a slightly more conservative approach to LA placement for brachial plexus blocks compared to popliteal sciatic blocks. When choosing between sub-paraneural (intra-plexus) and peri-plexus, several factors should be considered. If surgery is to be performed under the block alone (especially where general anaesthesia is to be avoided), I favour a sub-paraneural or intra-plexus technique. Caveats include having an experienced operator and excellent quality US imaging. If the block is for post-operative analgesia only, (surgery to be performed under GA), or where the operator is inexperienced, or US imaging is challenging, it may be wiser to stick with or peri-plexus technique. 1. Franco CD. Connective tissues associated with peripheral nerves. Reg Anesth Pain Med 2012;37:363-5. 2. Moayeri N, Bigeleisen PE, Groen GJ. Quantitative architecture of the brachial plexus and surrounding compartments, and their possible significance for plexus blocks. Anesthesiology 2008;108:299-304. 3. Bigeleisen PE, Moayeri N, Groen GJ. Extraneural versus intraneural stimulation thresholds during ultrasound-guided supraclavicular block. Anesthesiology 2009;110:1235-43. 4. Franco CD, Rahman A, Voronov G, Kerns JM, Beck RJ, Buckenmaier CC. Gross anatomy of the brachial plexus sheath in human cadavers. Reg Anesth Pain Med 2008;33:64-9. 5. Tran dQ, Dugani S, Pham K, Al-Shaafi A, Finlayson RJ. A randomized comparison between subepineural and conventional ultrasound-guided popliteal sciatic nerve block. Reg Anesth Pain Med 2011;36:548-52. 6. Missair A, Weisman RS, Suarez MR, Yang R, Gebhard RE. A 3-dimensional ultrasound study of local anesthetic spread during lateral popliteal nerve block: what is the ideal end point for needle tip position? Reg Anesth Pain Med 2012;37:627-32. 7. Perlas A, Wong P, Abdallah F, Hazrati LN, Tse C, Chan V. Ultrasound-guided popliteal block through a common paraneural sheath versus conventional injection: a prospective, randomized, double-blind study. Reg Anesth Pain Med 2013;38:218-25. 8. Karmakar MK, Shariat AN, Pangthipampai P, Chen J. High-Definition Ultrasound Imaging Defines the Paraneural Sheath and the Fascial Compartments Surrounding the Sciatic Nerve at the Popliteal Fossa. Regional Anesthesia and Pain Medicine 2013;38:447-51 10.1097/AAP.0b013e31829ffcb4. 9. Bigeleisen PE. Nerve puncture and apparent intraneural injection during ultrasound-guided axillary block does not invariably result in neurologic injury. Anesthesiology 2006;105:779-83. 10. Andersen HL, Andersen SL, Tranum-Jensen J. Injection inside the paraneural sheath of the sciatic nerve: direct comparison among ultrasound imaging, macroscopic anatomy, and histologic analysis. Reg Anesth Pain Med 2012;37:410-4. 11. Abdallah FW, Chan VW. The Paraneural Compartment: A New Destination? Regional Anesthesia and Pain Medicine 2013;38:375-7 10.1097/AAP.0b013e3182a34dfa. 12. Bernucci F, Gonzalez AP, Finlayson RJ, Tran de QH. A prospective, randomized comparison between perivascular and perineural ultrasound-guided axillary brachial plexus block. Reg Anesth Pain Med 2012;37:473-7. 13. Fredrickson MJ, Wolstencroft P, Kejriwal R, Yoon A, Boland MR, Chinchanwala S. Single versus triple injection ultrasound-guided infraclavicular block: confirmation of the effectiveness of the single injection technique. Anesth Analg 2010;111:1325-7. 14. Spence BC, Beach ML, Gallagher JD, Sites BD. Ultrasound-guided interscalene blocks: understanding where to inject the local anaesthetic. Anaesthesia 2011;66:509-14.